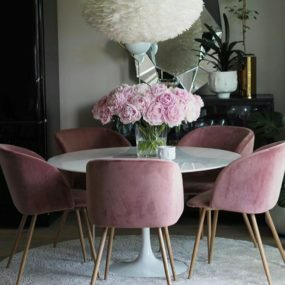 When it comes to home décor there are tons of options for a feminine touch in the home. However, adding a masculine feel could be a trickier task as there aren’t many ideas out there. We have put together a few of our favorite dining room upgrades that have a masculine aesthetic to them. A gray palette doesn’t necessarily need to be dark and dim, you can choose to have a light gray palette instead. Doing so will have a clean almost chic masculine aesthetic. Keep the entire decor with lighter hues of gray for that softer appeal. Using a dark gray palette in your dining room space is an easy way to add a masculine yet elegant appeal. 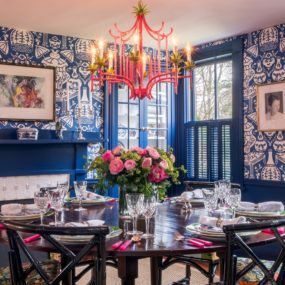 Pair with a dark, edgy light fixture to bring that class masculinity to the dining room without overpowering the dark hues you are already working with. A dark palette is mysterious and edgy with a flair. 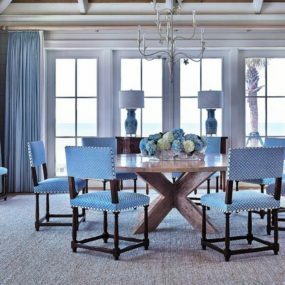 There is something beautiful and contemporary when the two design styles are combined in the dining room space. Add a fun light fixture for the perfect combination. If you are all about mystery a dark and dramatic space is the perfect way to add a masculine feel. You want to add a dark palette and pair it with dark furniture for that mysterious almost “dark” aesthetics. 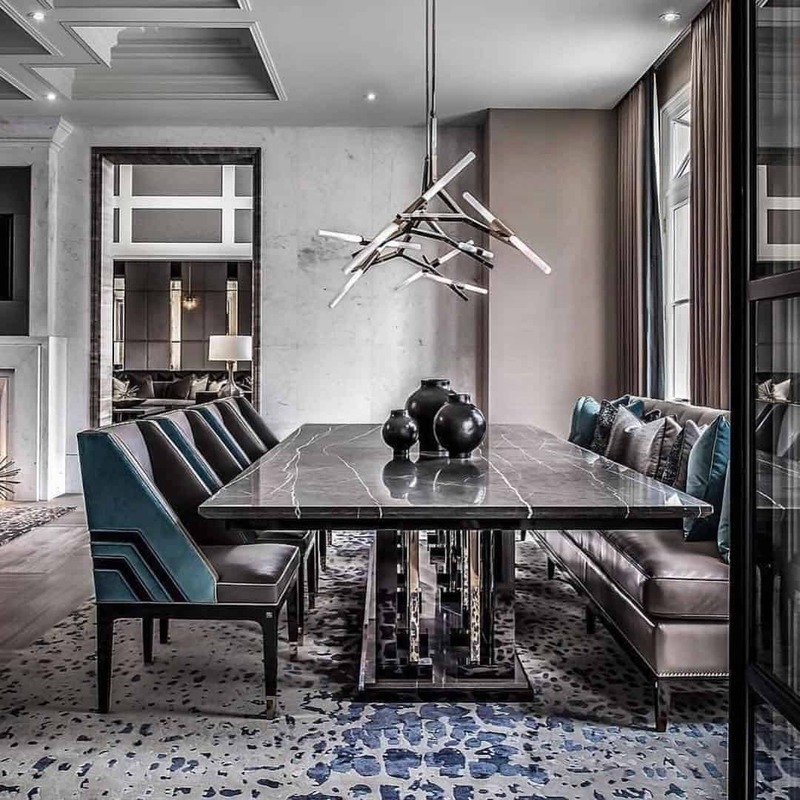 The key is working with a bold and daring dining table that seamlessly works in the context of creating this mysterious and edgy decorating style. Bright hues can also bring a masculine touch when they are paired with simple decor pieces such as wood and/or similar hues. The key is working with a color that is a more “softer or contained” then a traditional bright hue would. 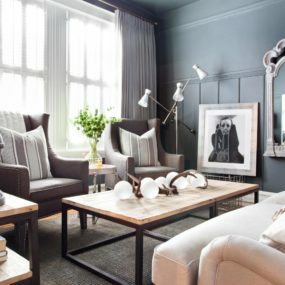 Just because a room will have a masculine beauty it doesn’t mean it has to be completely dark. Instead, you can add bright hues that add a full circle feel while still having a classic appeal in the room. The classic feel paired with bright hues adds a contemporary edge that simply works well together. 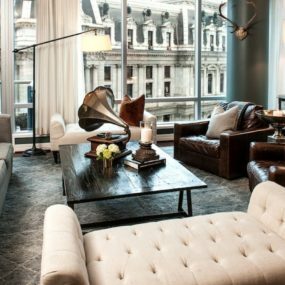 If you are not a fan of using a leather as part of your decor consider using multiple different seats that don’t necessarily work together but they feel apart of the space. Additionally, there will be a charming touch that is not too intense or bold for the seating area. 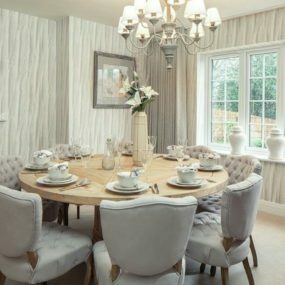 The idea of adding a masculine charm to the dining room may seem like a daunting one but it is actually quite simple. Keep your décor to a minimum is one of the best ways to do so. We recommend adding leather seats to your dining table for that hint of masculinity that is still charming and fresh. 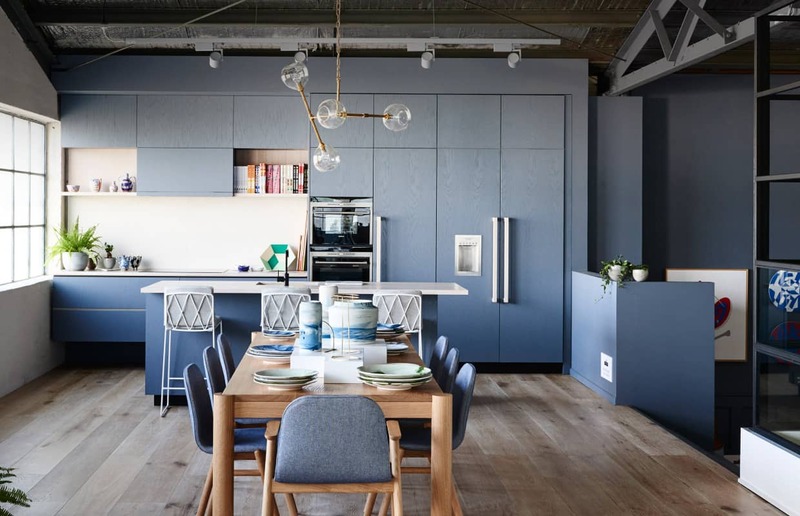 When deciding on what futuristic table to choose to add to your dining area consider using a table that not only looks futuristic but feels like it as well. Use a gemstone hue as part of your seating to bring your decor full circle. 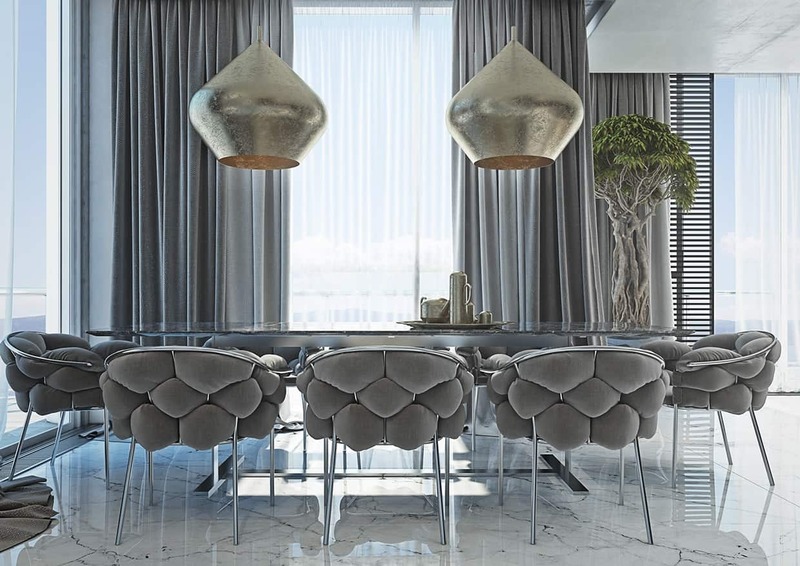 Futuristic décor is becoming the new “IT” décor style, so much so that having a futuristic dining table is the way to go. Not only does it bring a masculine touch, but it evolves the room in a simple yet futuristic manner. Pair your unique table with mix-matched seating for that futuristic appeal. An open floor plan is not only modern but it looks beautiful when you want to create a calming, airy space. The key is working with furniture that feels seamless in the space. You want the open space to appear as if there is no open or end to your decorating style. Having an open floor plan is not only airy, beautiful, and casual but it is also easy to decorate due to there being so many different décor items already being used in the space. 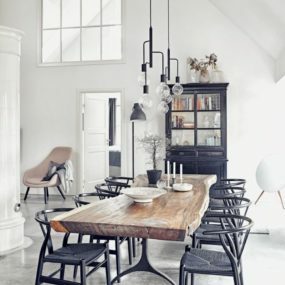 The key when working with an open floor plan and adding that masculine appeal is using a wood table and pairing it with darker chairs. Gray flooring is beautiful especially when it is laid out with a masculine aesthetics. 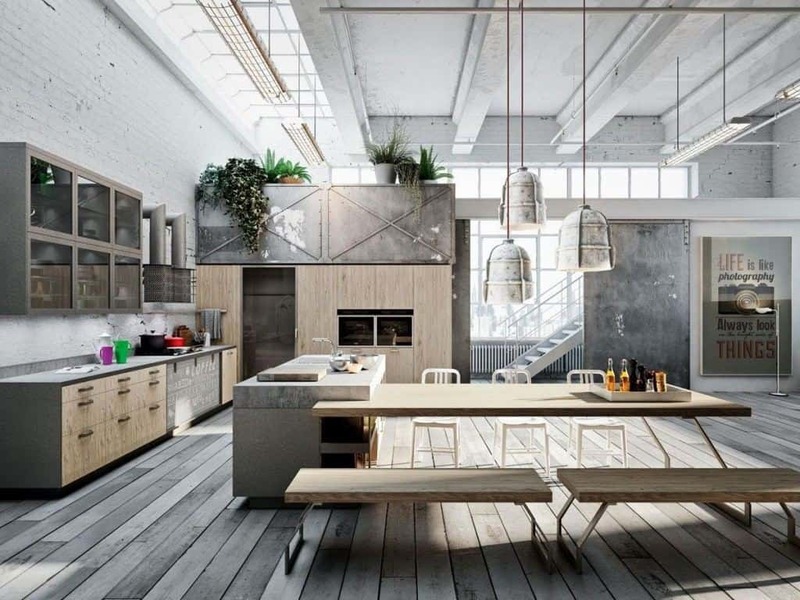 You want to work with neutral hues throughout the space to keep the area cohesive. Additionally, use unique light fixtures to bring it all together. 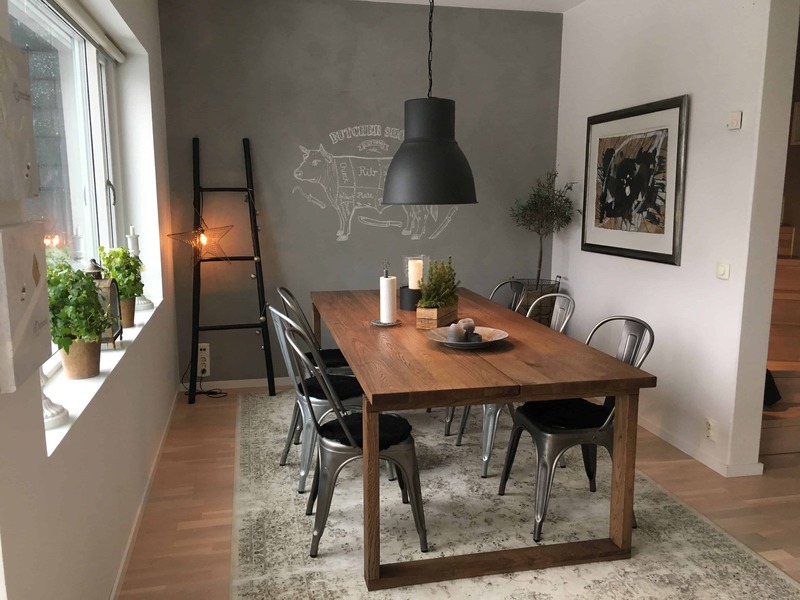 The flooring you use in your dining room could bring a masculine feel without the need of changing up your current décor. 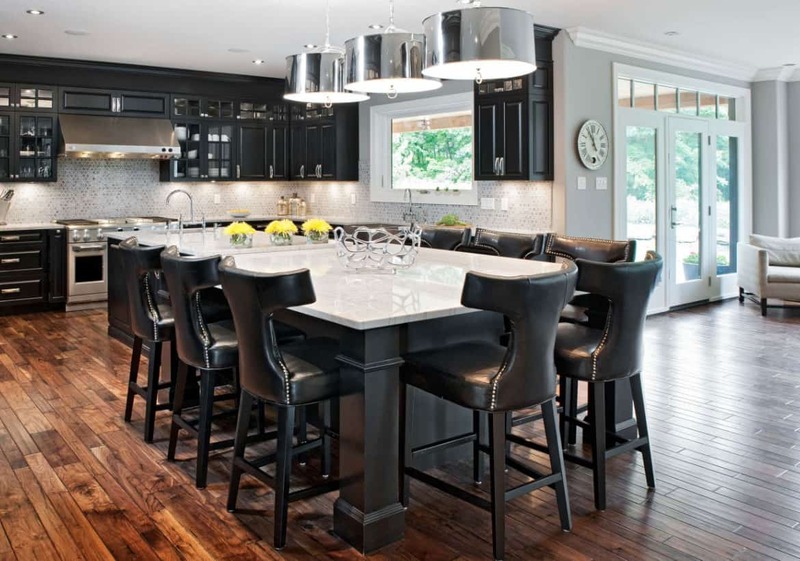 Opt for a “gray undertone” wood, this kind of wood appears less dark and frigid, yet it is still elegant. Which is perfect when you want to have a masculine appeal that stands out on its very own. Minimal decor can make a grand effect in any room especially when you are working with darker hues. Dark hues make a statement on their very own. Therefore, they do not need additional elements. Use a dark light fixture to bring that classic,minimal aesthetics. Men aren’t like women, in fact, they are completely different. While women love the idea of “more is always better,” men typically have a more laidback style. Therefore, to create that classic masculine beauty, consider taking a minimalist approach. Add hints of dark beauty and even use minimal dark pendant lighting. 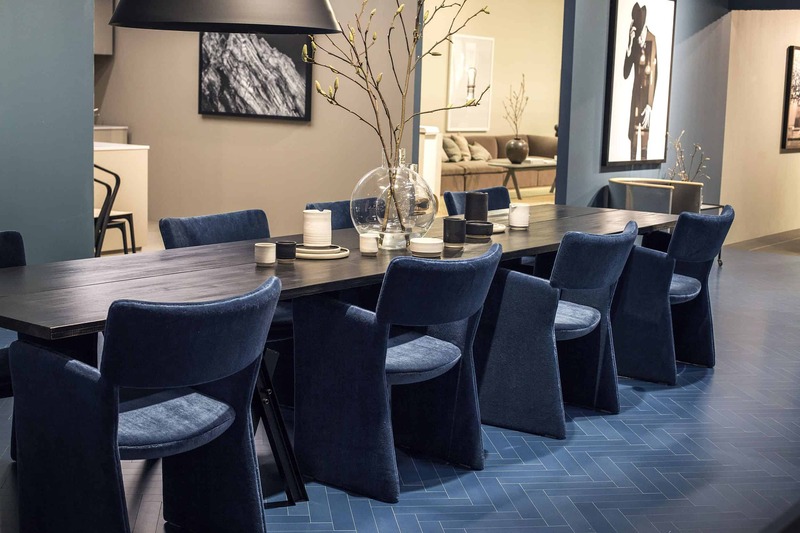 If you do not want to paint your walls a navy hue you can add it to your dining room by having navy blue seating. Pair with a dark wood table for a masculine contrast. Navy is such a powerful color that it comes to life when you pair it with more subtle hues. Additionally, it takes an edgy touch which is perfect when you want a masculine hint that isn’t overpowering. We love this color on the walls, as a big statement piece. A dark pendant light fixture can bring that edgy, masculine touch that does not take much room or change your decor completely. It will bring that masculine feel in a simple manner. 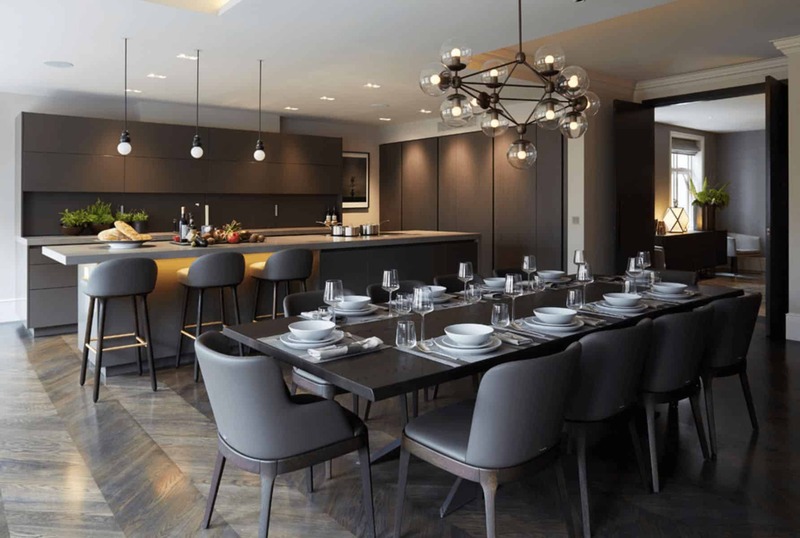 Nothing brings a masculine feel quite like a dark pendant lighting, especially when you decide to use a cluster of them. 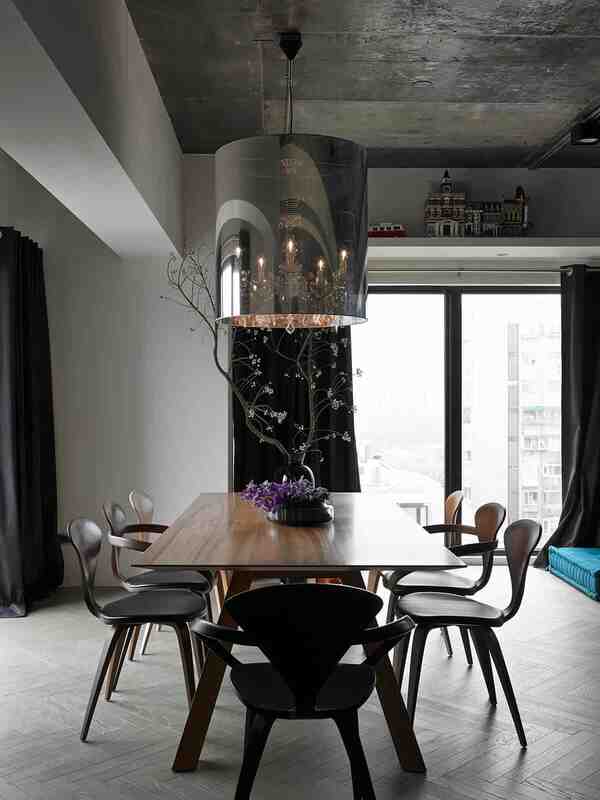 Use multiple pendants and place them at different levels in your dining area of a contemporary twist with dark hues. Metallic bits are important when you are working with darker hues, it has a brightening effect. This is exceptionally true when you are working with a light metallic such as silver or rose gold. These two hues are light enough to work well together while blending with darker shades. Metallics are excellent accent bits. 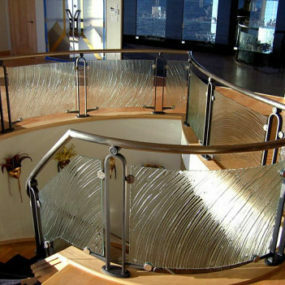 They are fun and easy to incorporate while being daring and fun. Keep the décor dark yet have that seamless metallic appeal. 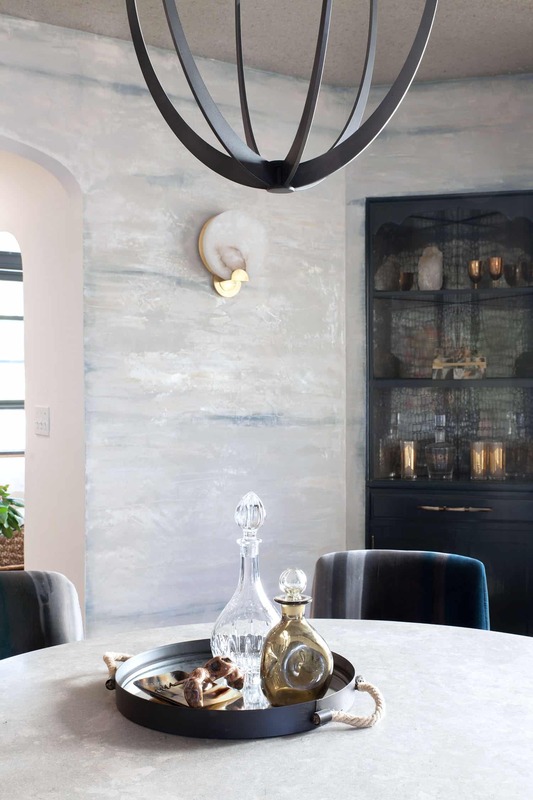 Consider a metallic light fixture or even having metallic décor on top of your table. How would you incorporate a masculine twist in your home? Please share with us your thoughts in the comments below.